Master Wei Qi He has practiced martial arts for over 47 years. She has also been an international performer and judge in major martial arts competitions for decades. In 1960, she was selected by the Shanghai Institute of Sports and Athletics. She won many medals and soon became one of the top female Wushu competitors in China. 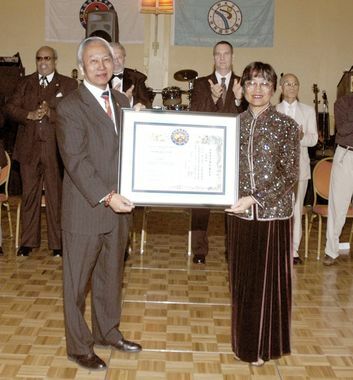 In 1974, Wei Qi He was part of the first official Chinese Wushu Delegation to the United States. During that trip, she was the featured performer in a demonstration at the White House for President Nixon.In 1976, Wei Qi He became the senior Wushu coach for youth at the Shanghai Sports Palace. Her team won first place honors for seven years in a row at the Wushu Competitions. They were also selected to present over 300 demonstrations to dignitaries from all over the world. Wei Qi He has been serving as Secretary General of the Yong Nian Boxing Society since 1982. In 1987, she was named Wushu Coach of Excellence.In 1989, Wei Qi He and her family immigrated to the United States, where she continued to coach students in the martial arts. During her first year in Knoxville, Tennessee, Shreng Lee Huang, one of her students, won the gold medal in an international competition. In 1995, teenage and adult members of Wei Qi He’s Richmond, Virginia team competed in Shanghai, where they won several first and second place awards. In 1999, her students from the Ross School Wushu Team of East Hampton, New York, also won many awards at the international competition and in the U.S.
Wei Qi He’s coaching expertise has not been limited only to students. She has led seminars in Japan, Singapore, Malaysia, Indonesia, Canada and England, where thousands of instructors participated. She is also co-founder of the 18-form Taiji Qigong system now practiced around the world. In addition to coaching student and instructors, Wei Qi He has also worked with Phoenix Films in Hong Kong as both an action designer and an actress. Wei Qi He is one of only two Wushu coaches in the United States to be invited by the Chinese government as a special guest of the East-Asia Games. In 1993, she was the first Wushu expert invited by the Taiwan government to train the Taipei Wushu Team for the 12th Asian Games. In 1994, she was invited to lecture in England and Canada. In 1996, she received a gold medal and certificate awarded by General Chen Shoushan of Taiwan for her outstanding contribution to the promotion of Chinese Wushu. In 1998, she received the award for overseas promotion of Chinese Wushu by the Wushu Institute of China and China’s Commission of Sports and Athletics. On August 12, 2000, she was featured on The Friday Evening News with Peter Jennings. In 2004, she was named “Woman of the Year,” and, in 2006, became the first Woman to be named to the United States Kuoshu Federation’s Hall of Fame.